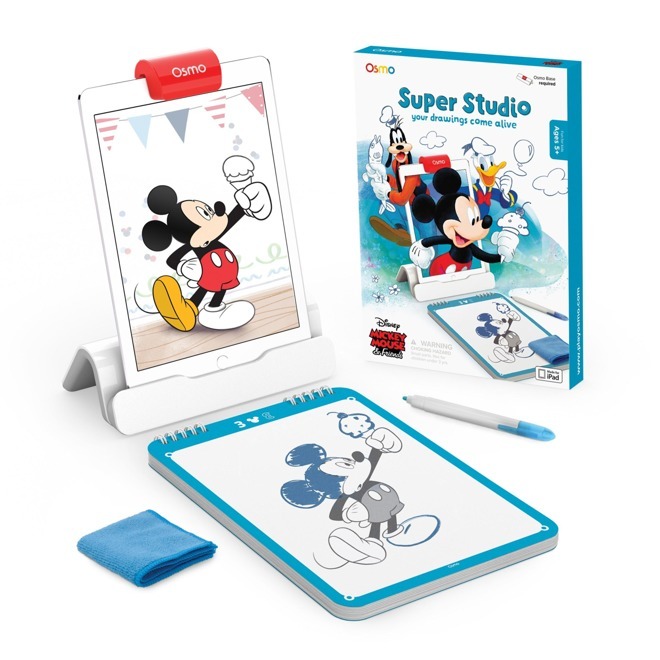 Osmo today launched the Super Studio, an add-on for its namesake iPad-based playset for kids, which here lets them interact with various famous Disney characters. An associated app takes players through a story with characters like Mickey Mouse and Donald Duck. Kids make progress mainly by creating real-world drawings, for example supplying characters with toys, tools, food, and scenery. In some cases, kids may be asked to draw the characters themselves. Osmo's dock and software lets an iPad see the sketchpad front of it without having to tilt the tablet. The solo Super Studio costs $19, and is meant for kids 5 and older. The device still needs an Osmo iPad Base however, which is normally $29. Apple stores will soon be selling an exclusive Super Studio Kit that comes with the base at a cost of $59. It's not clear what else would be in the Kit to justify its price, which is $11 more than Studio and the Base are in Osmo's own bundle. Osmo has launched branded setups in the past, such as its MindRacers kit, which uses Hot Wheels cars.